Mezzo-soprano Hilary Ginther enjoys a career that embraces three centuries’ worth of operatic repertoire from contemporary to baroque. Opera Now Magazine profiled her in May 2016 as one of ten young American singers intent on taking the opera world by storm (“Written in the Stars”), calling attention to her “substantial and richly colored instrument”. 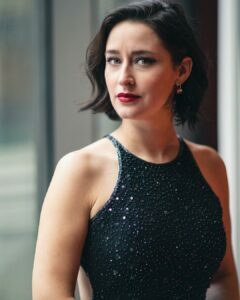 Ms. Ginther’s Philadelphia Orchestra debut as a featured soloist in the orchestra’s first-ever performances of Bernstein’s MASS under the baton of Yannick Nézet-Séguin has been recorded by Deutsche Grammophon and was internationally released in March 2018, in commemoration of the composer’s centenary. In the spring of 2019, Ms. Ginther returns to Fargo-Moorhead Opera to reprise the title role of Bizet’s Carmen, which she had debuted earlier in her career, and makes her Fort Worth Opera debut as Judy Sinclair in the world premiere of Rachel Peters’ Companionship. Future engagements include two major Tchaikovskian role and company debuts: Joan of Arc in The Maid of Orléans with New Orleans Opera (2020) and Olga in Eugene Onegin with Opera Omaha (2021). Throughout the 2017–2018 season, Ms. Ginther made a series of auspicious debuts on both coasts. She joined MidAmerica Productions on a program of Haydn and Forrest for her Carnegie Hall debut, followed by her New York City Opera debut as Lureen in the US premiere of Charles Wuorinen’s Brokeback Mountain, and concluding with her Los Angeles Opera debut performing a double bill of Gordon Getty’s operas Usher House and The Canterville Ghost. During the 2015–2016 season, Ms. Ginther displayed the range of her artistry as both Rosina in Rossini’s Il barbiere di Siviglia and the imprisoned Vlasta in Mieczysław Weinberg’s The Passenger, both with Florida Grand Opera. Also with Florida Grand Opera she covered Liese in The Passenger and Adalgisa in Norma. Ms. Ginther has fulfilled young artist residencies with Florida Grand Opera, Crested Butte Music Festival, Fargo-Moorhead Opera, Virginia Opera, Wolf Trap Opera, and Opera Saratoga. She has also performed with Opera in the Heights, Opera Fayetteville, Cincinnati Opera, and Mississippi Opera. Ms. Ginther was a semi-finalist in New Jersey State Opera’s 2018 Alfredo Silipigni Vocal Competition, named after NJSO’s legendary founder and artistic director. She has also been awarded the Rosalind Jackson Memorial Award for Excellence from Crested Butte Music Festival. She holds a Master of Music degree from the University of Cincinnati, College-Conservatory of Music.